I like eating beancurd / tofu very much and this is one of the dishes I usually choose when I have economy rice at the food stalls. Tofu comes in many forms – firm, soft, with egg, etc. Japanese tofu is usually very smooth in texture and rather soft to the touch. 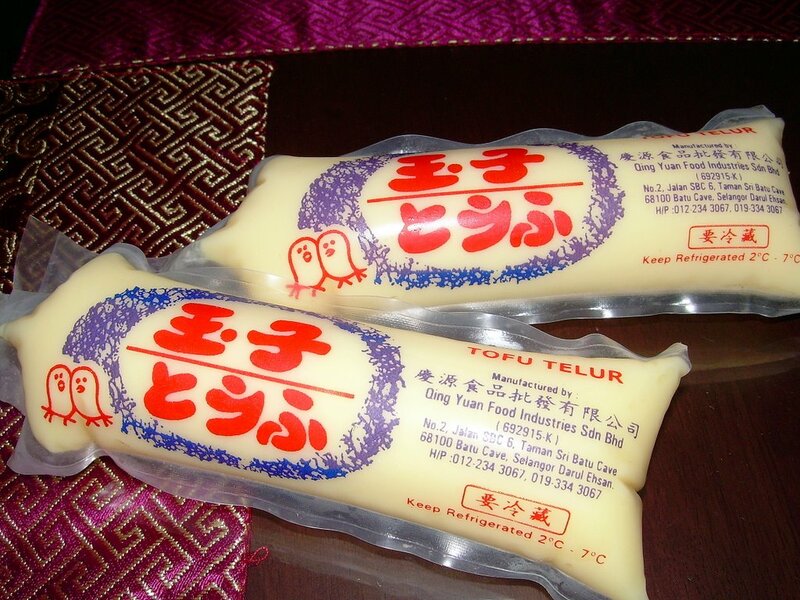 One of the most common Japanese tofu available is the ones sold in tubes. 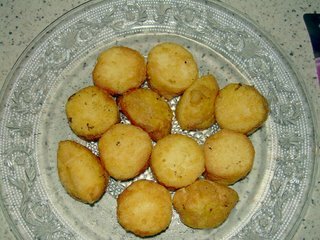 These tofus usually has eggs as one of the ingredients and it is slightly salty to taste rather than neutral. Bearing in mind that it is already “tasty” on its own, the gravy should not be overpowering in taste. Otherwise, you would have missed out on the tofu’s original taste. 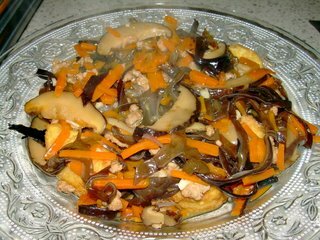 In this recipe, I have cooked a gravy based on finely cut mushrooms (dried chinese mushrooms or shiitake mushrooms to be exact) and wood-ear fungus. I also throw in some julienned carrots for a contrast in colour as well as to provide natural sweetness to the gravy. The crunchiness of the wood-ear fungus and the smooth smoky taste of the mushrooms provide an interesting biting experience. I ran out of spring onions when I was cooking this dish but you may wish to throw in some for added colour as well. 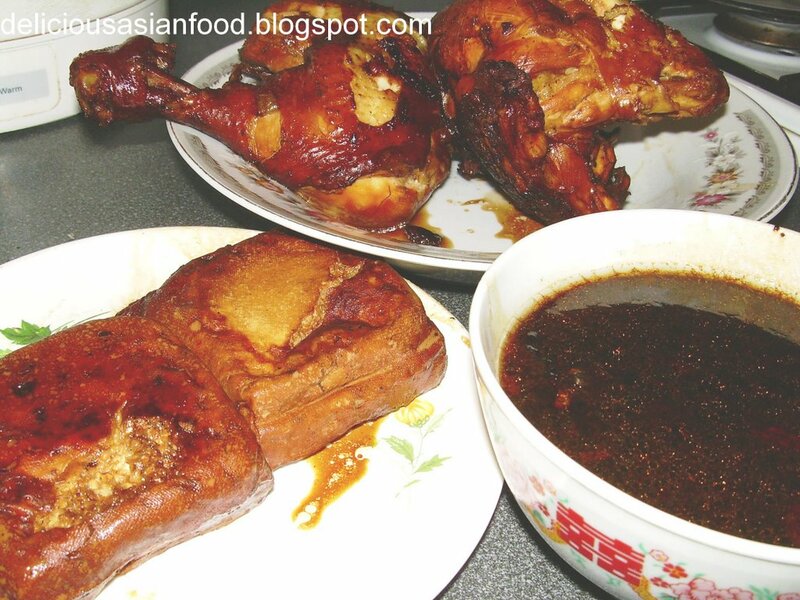 Marinade the minced meat for 30 minutes. Deep fry the tofu on high heat till golden brown. (Tip: Place cut tofu on plate and dust / sprinkle 3 teaspoons of corn flour to lightly coat the tofu before frying. The tofu will turn out crispy on outside). Remove and line on plate. Use 1 1/2 tablespoons of the oil previously used for deep-frying and heat it up in a wok. Fry the garlic with minced meat till minced meat is cooked. If no minced meat is used, fry the garlic with wood-ear fungus and mushrooms on medium heat till garlic browns. Add carrots and stir-well. Add oyster sauce, water and close lid to bring to boil. Once boiled, reduce to medium low heat to simmer for 5 minutes and add salt to taste. (The longer your simmer, the better tasting the gravy will be). Add cornstarch gradually to thicken gravy to your desire. Pour gravy over the pre-fried tofu and serve hot with rice. Further to my last post on Long Beans Rice, I did mention there that it tastes great with soup. I am referring to Kiam Chye Tau Foo Soup which is basically Salted Mustard Leaves and Beancurd Soup in Hokkien dialect. Somehow or rather, the salty, sour and sweet nature of this soup complements the Long Beans Rice well. Remember the water used to boil the belly pork in the Long Beans Rice recipe? The stock is used for this soup and in fact, you can retain a couple of slices of the pork to enhance the flavour of this soup. Nothing goes to waste! See the Long Beans Rice recipe for the preparation of the stock. This is my recipe for Kiam Chye Tau Foo Soup. Bring stock to boil and add tomatoes and salted mustard leaves. Simmer for 1 hour or more. 3 minutes before intended serving, bring back to boil and add beancurd. I like beancurd (aka. 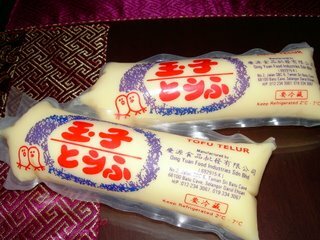 Tofu). It is so versatile and many recipes can be created out of it. You can fry it, steam it, boil it, mash it with ingredients etc. And the best thing is, it is relatively cheap and highly nutritious. There are many types of tofu. Some are hard in texture and some soft. 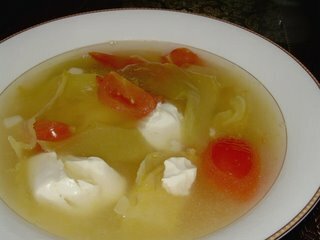 Just click on the Tofu link on the right hand side of this site for other tofu recipes. In this recipe, however, I use the soft type of tofu which is measures approximately 6cm x 6cm x 2cm (W x D x H) and more ingredients are used. 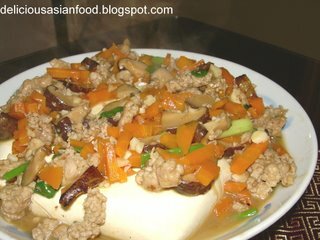 This is my recipe for Beancurd with Minced Pork. Though it suggests minced pork, I have added other ingredients to give it some colour. Feel free to experiment! 3 pieces soft beancurd. Alternatively, you can use Japanese Beancurd. Chinese dried mushroom (pre-soaked and cut to strips) or other button mushrooms. In fact, any type of mushroom will do or you can omit it altogether. Fry shallots in cooking oil till brown. Remove shallots. Heat up the remaining oil and fry the garlic till beginning to brown. Add minced meat and stir fry for about 30 seconds. Add carrots and mushrooms and continue stir frying for a minute. Add seasoning (minus the chinese cooking wine). Add water till it completely covers the ingredients and let it boil. Once the water boils, place beancurd gently on top of the sauce / meat and cover the lid (in a way, you are steaming the beancurd whilst cooking the rest of the ingredients / gravy) for 2 to 3 minutes. Ensure that the gravy does not dry out. Open lid, remove beancurd gently and place on a plate. Add chinese cooking wine to the meat sauce and stir to mix well. Add corn flour to the meat sauce to to thicken sauce to your liking. Add spring onions, give it a good stir and pour the meat sauce over the beancurd. Sprinkle fried shallots over the dish.